Knowing which orchid you are trying to grow is your key to its cultural requirements. Orchids, like all plants, need a balance of light, air, water and food to grow and flower well. Let’s examine each of these elements. Without enough light, orchids may produce lush looking growths but no flowers. Not giving orchids enough light is the most common reason for failure to bloom. The old notion of orchids growing in dark jungles still persists and it couldn’t be further from the truth. In reality, many have evolved as epiphytes to take advantage of brighter light available in the upper forest canopy. How much light is enough? The answer to this seemingly simple question is “as much as they will take without burning.” This means that the foliage should not be a lush, dark green. Orchids grown under sufficient light will have lighter, somewhat yellow-green foliage and strong upright growths. The image below illustrates two cattleyas, one grown under optimum light conditions and the other under too little light to produce flowers. 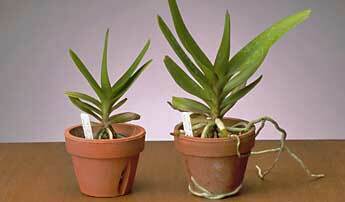 ABOVE: Two Cattleya plants grown under different lighting conditions. The plant on the left was grown in sufficient light to produce abundant flowers. The plant on the right was grown under too little light to flower. The dark green leaf color of the non-flowering plant indicates too little light. Orchids roots, and eventually the entire plant, will die if they do not get air and this is the reason that, with the exception of a few terrestrial varieties, orchids do not grow in soil. Orchid potting media should be open, with exceptionally good drainage, yet capable of holding sufficient moisture to support the plant’s needs. 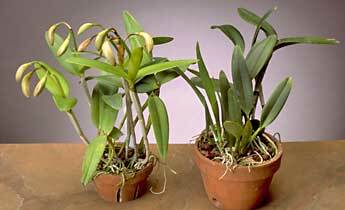 Orchid plants are also intolerant of a stale, stagnant environment. You should strive for a buoyant atmosphere and gentle air movement must be provided at all times. For orchids grown in the home, this can be provided by an overhead paddle fan set on it’s lowest setting or a portable oscillating fan directed AWAY from the plants. ABOVE: A ceiling fan provides gentle ventilation for orchids in the home and simulates the breezy climate most orchids come from. 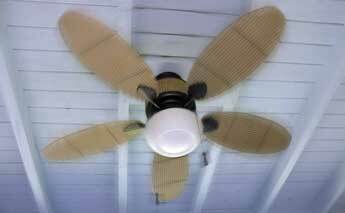 A well-ventilated growing area discourages disease. Without question, more orchids are killed by incorrect watering than by any other reason. Proper watering consists of two separate components; quantity and frequency. Orchids should be watered just as they dry out. There’s unfortunately no magic formula; i.e., water a plant in a 6″ pot every 7 days and you’ll be trouble free. This is because your growing area is different from anyone else’s. Humidity, air movement, potting medium (type and age) and light levels all play a role. There are several ways to determine when a potted orchid is almost dry: 1) the surface of the potting mix will appear dry; 2) dry pots will feel lighter; 3) clay pots feel dry; 4) a wooden stake or skewer inserted into the potting mix will come out almost dry (Figure 2). If in doubt, a finger inserted into the potting mix is perhaps the best tool to determine the moisture content of the potting mix. It will cause no harm to the plant. When orchids are watered, they should be watered copiously. Water should be provided until it runs freely from the drainage holes. Not only does this soak the potting medium but it also flushes salts that naturally accumulate. At a minimum, try to thoroughly water your plants at least once a month. Watering frequency can be controlled by the choice of pot. For those who really like to water their plants or live in humid, rainy areas, clay pots, especially slotted pots are a good choice. Growers in drier climates or those who tend not to water often enough might want to use plastic pots to hold moisture longer. When an orchid is overwatered, root loss is the result. 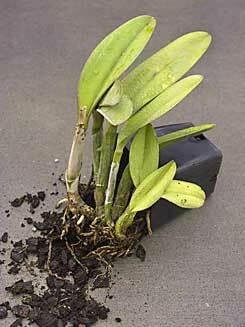 Without roots an orchid cannot take up water or nutrients and eventually, will get weak and die. Orchids will grow and flower, given that their other requirements are met, for fairly long periods without fertilizer but you’ll get better results with some level of feeding (Figure 3). Typically plants are fertilized once a week during the summer and every two weeks in the fall and winter. Regardless of the fertilizer that you chose to use, most experienced growers use no more than ½ the label-recommended strength. Oh, and by the way, it’s best to water first to wet the potting medium before you fertilize. Fertilizers used on orchids should contain little or no urea. This is because soil organisms must first convert the nitrogen in urea to a form useable by plants, and since orchids do not grow in soil, this conversion does not occur efficiently. The old conventional wisdom used to be that orchids grown in bark mixes needed to be fertilized with formulations high in nitrogen, i.e., 30-10-10. We now understand that these high nitrogen fertilizers aren’t necessary. For a more detailed discussion of fertilizer and its dependence on water quality see the June 2003 and February 2008 issues of Orchids magazine or view copies of pertinent articles online here at www.aos.org. ABOVE: Two Vandaceous seedlings illustrate the results of regular fertilization. The seedling on the left was grown without fertilizer while the one on the right was fertilized regularly. The plant on the right will reach flowering size and produce more blooms than that on the left. Most experienced growers will agree that observation is the most important key to growing orchids well. Examining your plants on a regular basis will allow you to adjust and correct any problems before they become severe. In subsequent articles we will examine in more detail these four elements of culture and the orchid genera more commonly found in the marketplace. For more detailed information regarding growing orchids, see Orchid Resources www.aos.org. This Article is Courtesy of the American Orchid Society and Republished from www.aos.org. The AOS copyright and contact information may not be removed or modified.